What happens after you've just gone on an action-packed, fun-filled vacation shooting a variety of interesting things? You go back to work, sleepy and tired, and take a picture of the most boring thing you can find. 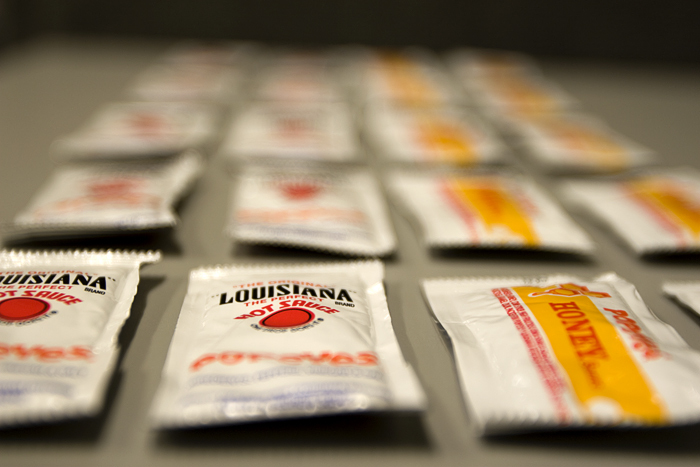 Also, I found it strange that Popeye's gave me so many hot sauce and honey packets. All I had were two pieces of chicken and some mashed potatoes. Incidentally, I don't even care that the "horizon" isn't level. I love this photo and the variety of sauce packets! But there are just two... hot sauce and honey!